Well before the middle of the 19th Century controls against counterfeiting became painfully obvious. Paper documents such as letters of credit and stock certificates necessarily had to be difficult to reproduce. A small group of bank note engraving firms consolidated in 1858 to create The American Bank Note Company. By developing its own unique papers, inks, printing techniques and ornate, complicated designs it quickly won valuable commissions including postage stamps, bank notes, bonds, checks and revenue stamp. In 1891 The American Express Company hired the firm to produce its new Travelers Cheques. By the turn of the 20th Century The American Bank Note Company was among the preeminent bank note printers and engravers in the U.S. After several expansions and moves, the company decided to separate its management and sales offices from its printing facilities in an act of real estate practicality and efficiency of operations. 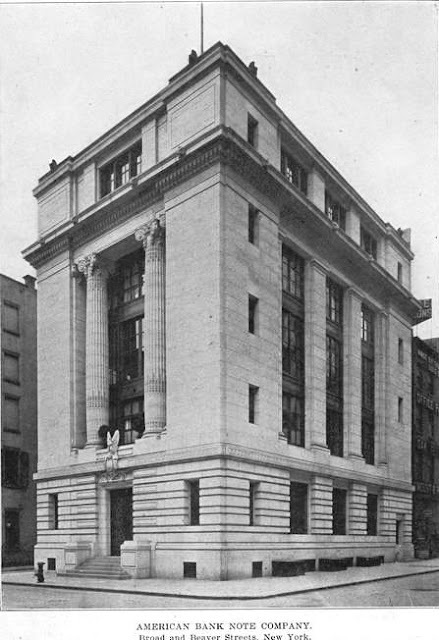 In 1907 a new headquarters building was planned for 70 Broad Street, in the heart of the financial and banking district where the firm’s clients were situated. A new printing plant would be erected far uptown in the Bronx. Kirby, Petit & Green was commissioned to design the new head offices. Henry Kirby, senior partner, had a major hand in the design of the 1889 New York Times building on Park Row, John Petit was widely known for his work as official architect in the Prospect Park area of Brooklyn, and James Green studied at the prestigious Ecole des Beaux-Arts in Paris. The seemingly odd mix of talents had already produced interesting buildings like the Bush Terminal Company building near the new American Bank Note site. Completed in 1908, the impressive 5-story granite structure took advantage of an unusual slim lot bordered by streets on three sides, making it appear free-standing from the Broad Street vantage point. Oversized three-story fluted Corinthian columns flanked deeply recessed windows over a rusticated base. A large, carved eagle over a medallion, the firm’s emblem, perched over the Broad Street entrance, reached by a short flight of steps. The side facades were identical, featuring three stacked bays of large windows separated by stone pilasters. The fifth floor, where the executive offices and private dining room were housed, sat above an impressive deep cornice and, roosting above the modest roofline, unexpected gargoyles peered down. 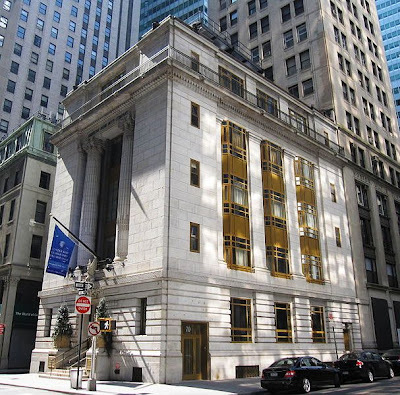 The American Bank Note Company stayed on at 70 Broad Street until 1988 when it relocated its headquarters to Blauvelt, New York. The move would herald drastic changes for the staid old Broad Street structure. 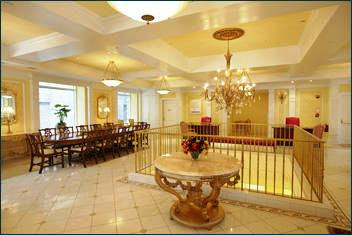 Sold to real estate investors, the grand main floor became the Wall Street Kitchen and Bar in 1996. In the lobby where financial businessmen in Brook Brothers suits once met, leather booths and wooden chairs filled the two levels. Eight television sets were strategically situated around the bar and dining areas so patrons could easily monitor stock prices. In the meantime the Maharishi Mahesh Yogi was looking for real estate for his newly-founded Global Country of World Peace. The guru had become internationally famous in the 1960s and ‘70s when his Transcendental Meditation process swept the world. First introduced in the 1950s, his technique became passionately accepted by the Beatles, Jane Fonda and other influential names of the period. The Global Country of World Peace is a non-profit organization with a “global mission to improve quality of life on Earth by improving collective consciousness,” according to an organization spokesperson. Centers called “Maharishi Peace Palaces” were cropping up world-wide. New York City was next on the list. The group purchased the building in 2004 for $5.5 million and immediately started renovations. The lower floors became spaces for instruction, lectures and meditation (meditation classes cost between $750 and $1,000 for four one-hour sessions), while the upper floors were revamped into luxury apartments for use of guests or Global Country of World Peace officers. Indeed the mixed-use zoning of the 15,000 square foot building included residential use. Buyers did not, however, rush to purchase the property, referred to as a “townhome” by some realtors. The price tag was reduced to $30 million, then to $25.5 million. The “townhome” was suddenly being marketed as a “multi-family” property. While 70 Broad Street waits for a buyer, we are left to lament the unfortunate replacement of the original windows with bronze-tone modern replacements, including protruding bay windows on the side facades. Designated a New York City landmark in 1997 it does, however, retain most of its exterior architectural distinction. It is an imposing structure on an unusual slice of lower Manhattan.